Happy National Bourbon Day! While the day has been rough on a lot of levels, having a good bourbon is the right way to end it. So, tonight, I am opening a bottle I picked up last Saturday from Hokus Pokus on special allocation since they only got six bottles, but which I got to sample at Buffalo Trace’s Whiskey Weekend in April. E.H. Taylor 100 Proof Bottled in Bond Four Grain Bourbon. I like this bourbon. It’s old school. Bottled in Bond whiskey was the original top shelf small batch bourbon. Col. Taylor helped get the Bottled in Bond Act passed. The distillate in the whiskey must come from a single distillery, a single distiller, during a single distilling season (a year). It is barreled and stored in a bonded warehouse under the watchful eye of the US Treasury. The distillery only pays taxes on what is bottled rather than what is in the barrel. Oh, and it’s always 100 proof. Bottled in Bond is no bourbon lite. This is new school bourbon too. Four Grain! Instead of corn, rye and barley or corn, wheat and barley, this one has both rye and wheat as flavoring grains (or small grains as they are often called). A nice bourbon nose and palate that has Weller’s softness with Taylor’s usual rye spice. 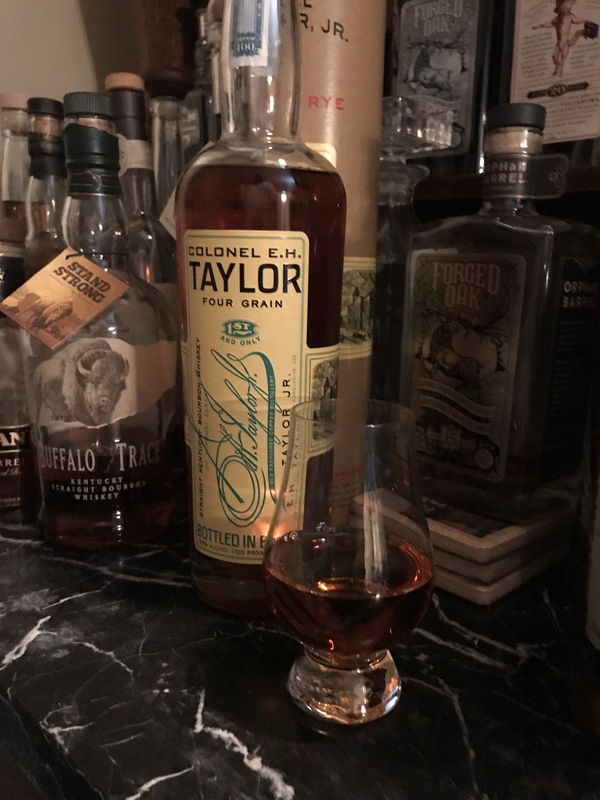 The finish is wonderful; less dry than a lot of high end bourbons out there and something I have always liked about E.H. Taylor bourbons, specifically the small batch and the single barrel. This is a very sweet and floral bourbon; perfect for summer but would not be something I would pick to have with a dessert or a cigar. This is a good sipping bourbon to have neat; if you can find a bottle. Bradley, thank you for the review. I have a chance to purchase this release and although it is a BT product was on the fence whether or not it would be something I would like. From your description I think it is worth trying. Thanks.